Before you pull out that box of brownie mix or down a dozen Rolos, think twice — this keto, low-carb, gluten-free brownie recipe may be all you need to satisfy your caramel chocolate craving. The delicious caramel flavor mixed with dark chocolate and a hint of sea salt make these tasty treats your must-have dessert when you’re watching your sugar intake but need to satisfy that nagging sweet tooth. In fact, low-sugar dessert recipes are an essential part of any weight maintenance plan. It’s important to have a treat now and then, and it’s even more crucial that your desserts are keto-friendly. Brownie batter for dessert, anyone? And much better than the ingredients you would find in a box brownie mix, these chocolate brownie salted caramel bites are rich in health-promoting ingredients like almond flour, cacao, collagen, and sea salt. Next time you come across a box mix, turn it over and look at the back of the box — you may be shocked at the ingredients, which include artificial flavorings and blood sugar-busting additives. Enjoy these salted caramel brownie truffles cool or at room temperature, and as always — guilt free. When you’re trying to shed a few extra pounds, finding alternative dessert options is a must. Going cold turkey may work for a week or two, but if you tell yourself you’ll never eat salted caramel brownies again you’re setting yourself up for disaster. Not because you’re weak, but because you’re human. These salted caramel brownie truffles serve as a terrific weight loss dessert. They’re not only low in sugar, but they also have some specific ingredients that may boost your weight loss efforts. MCTs (medium chain triglycerides) have been shown to promote a feeling of satisfaction and ultimately reduce food intake. In one study, a group of overweight men consumed either long-chain fatty acids or MCTs at breakfast, with the goal of assessing how much they consumed later in the day. The results showed that when the men consumed MCTs, they ate less at lunch, the assumption being that MCTs decreased appetite[*]. MCTs may also help you burn off stubborn fat around your midsection — fat that’s correlated with more serious issues like metabolic syndrome. In one study, a group of men consuming MCTs experienced increased energy expenditure, along with decreased abdominal fat[*]. Vitamin E is an antioxidant, meaning it balances oxidative stress that happens as part of your everyday life. Oxidative stress is an unavoidable part of being alive, and it’s not always a bad thing. In fact, even exercise can cause oxidative stress in your body[*]. 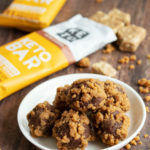 Almonds are a fantastic source of vitamin E, and this recipe not only contains almond flour — but also almond butter from the Perfect Keto Salted Caramel Bar[*]. Along with its antioxidant activity, vitamin E has also been shown to improve eye health, support brain function, and may even protect your heart from cardiovascular disease[*][*][*]. One study even found that people with higher vitamin E intake had a 20% lower risk of age-related macular degeneration, an eye disease that causes vision loss[*]. Perfect Keto Salted Caramel Bars contain grass-fed collagen, a nutrient that’s been studied for its potential role in joint health. Collagen is a structural protein that makes up your skin, hair, joints, and other connective tissue. Healthy connective tissue is essential for the structural functioning of your body, and dysfunction of connective tissue can result in a host of issues, including joint pain[*]. One study looked at the potential role of collagen supplementation on osteoarthritis patients. For 90 days, patients were given either collagen supplements, or glucosamine and chondroitin. The results showed that patients taking collagen supplements showed significant enhancement in daily activities, suggesting a better quality of life[*]. Another clinical trial was done on collagen supplementation and joint pain, this one focusing on athletes. Athletes are considered a high-risk group for joint deterioration due to increased wear and tear, so the study aimed to see if there was a role for collagen in the preservation of joint health. Two groups were given either placebo or collagen, and after 24-weeks the collagen group showed significant improvement in joint pain[*]. There won’t be enough collagen in one serving of salted caramel brownie bites to heal joint pain, but every bite of collagen counts. It’s natural to want sweets like brownie batter and cookie dough now and then — even on a keto diet. So, the next time you’re craving a sweet treat, make sure to whip up a batch of these delicious no-bake chocolate truffles. They’re the perfect intersection of cake pops and salted caramel brownie bites and are sure to leave you feeling fulfilled and satisfied. Remove Perfect Keto bar from wrapper and break into small pieces. Place on a parchment lined baking sheet and broil on high for 3-4 minutes or until golden brown. Remove from oven and place pieces into a small food processor. Pulse on high until you have fine crumbles and place on a small plate. Add almond flour, cocoa powder, sweetener, extract, and butter to a small bowl. Mix until dough is smooth and ingredients are evenly distributed. Divide and portion dough into small bite-size balls. Roll with hands to smooth. Roll each truffle in the crumble mixture and place on a plate or baking sheet. Place in the fridge or freezer for 10 minutes to firm and set completely. Enjoy cold or at room temperature. Sounds wonderful; I plan on using this recipe.